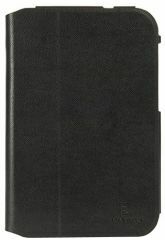 Tucano Leggero Folio Case for Samsung Galaxy Note 8.0"
Leggero is the Samsung Galaxy Note 8.0” cover, made with soft polyurethane leather-effect rubber. Thanks to the MagLocker system patented by Tucano and integrated into the retractable rear flap, it is possible to lock the cover at the back to keep it out of the way. Furthurmore, the front closure is made more elegant and secure thanks to a second magnet in the frame. One need only position it and, without a sound, it stays still in its place! The Smart Magnet function also optimises the device's energy consumption and sleeps the Galaxy Note 8.0” every time the cover is closed. Finally, by raising the rear flap in a simple movement, Leggero transforms into a practical two-position stand: for writing, for browsing on Internet, or to watch films and photos. The interior is coated with a soft anti-scratch microfibre to protect the screen from impacts and dust, while the side-access frame, with its securing flap, keeps the tablet firmly in its place. The cover automatically wakes and sleeps the Galaxy Note when opened and closed. TUCANO Tucano Leggero Folio Case for Samsung Galaxy Note 8.0" Black Tucano Leggero Folio Case for Samsung Galaxy Note 8.0"